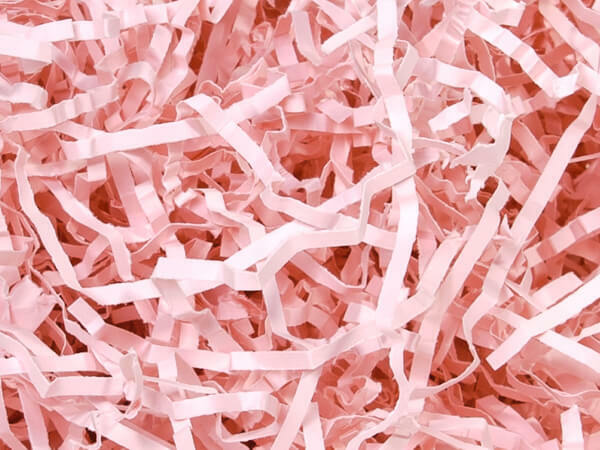 Pink Eco Fill Accordian Paper Shreds is made from 100% recycled paper. Shred is approximately 1/8" and sold in 6 lb. cartons. Green Way® Eco-Friendly Packaging. Made in the USA. NOTE: Product ships as Dimensional Weight of 15 LBS due to volume of carton (11.25"x15"x17.25"). Product ships from separate warehouse via normal ground service, only to US destinations & cannot be expedited. Allow additional time for order processing and shipment. We offer this paper shred in the most popular colors! We have the perfect shred for your gift basket filler, Easter baskets, and basket box ! Our crinkle cut shreds are made from a heavier basis weight of paper than most competing shreds and expands to twice its volume. Pound for pound this shred will fill at least 50% more containers. This shred provides excellent support for your medium to heavy weight products and the 6 lb box is smaller than its competitors 10 lb box, but can stuff the same amount of containers! Plus dimensional shipping charges are much less! Because the product is made close to the mill, we can sell it for less and because of the quality of paper.... it will go farther! These crinkle accordion shreds are produced from paper made just down the street at the 140 year old family run French Paper Mill in Niles, MI. Not only is the paper 100% recycled, but the mill itself is "off the grid", meaning it is totally water powered producing its own electricity from the nearby St. Joseph River. Even the discharge from the mill is cleaner than the water in the river! This mill was green before green was cool and earns a special recognition in the Green Way brand.